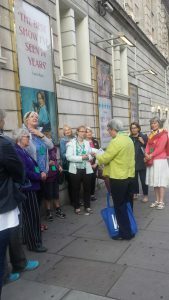 Marking the centenary of both WW1 and the WI, Blue Badge guide Janet Smith led us on a very interesting walk through Central London highlighting the vital role of women in the First World War and how it changed their lives forever. 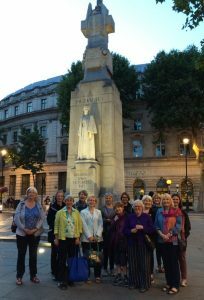 We heard how women ‘did their bit’ to keep the Home Front running: not only as nurses and munitionettes but by taking on almost every job previously done by men – as bus conductors, police patrols, farm hands and even road-menders and coal-heavers. 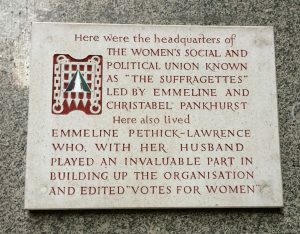 And we learned more about some specific women including the Pankhursts, Louisa Garrett Anderson, Agatha Christie, Vesta Tilley, and Edith Cavell. 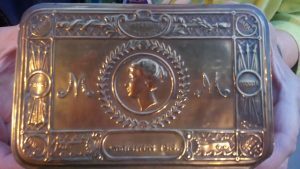 Our guide even brought along the tin which her grandfather had received on the Western Front which had contained chocolates & cigarettes – a Christmas gift from Princess Mary. 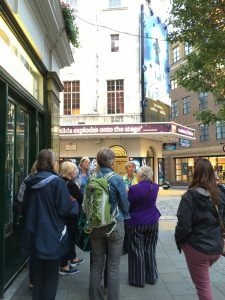 It was a lovely summer’s evening and despite the tube strike we had a good turnout and a nice catch-up in the pub afterwards.